The headboard I painted for my daughter. You may remember how I tried to destroy it. I cleaned up the table and spray painted the two solid wood chairs with some red paint from my stash and sold them together at a garage sale. I haven't done anything with the little salmon leather chair but I will. Someday. Speaking of money. We woke up this fine Father's Day and found that our house had been broken into and robbed. They took Mr. Quirky's work lap-top and phone. Not a work laptop like you bring home from the office, but a work laptop like you work at every day - as in all the time. A big problem. They also took my purse. My purse with $140 cash in it. ARGH! That's enough cash for like two months of garage sales groceries! We spent the entire morning dealing with the police, various customer service departments and racking our brains. What on earth was in my purse? Well my ATM card for one. Which thank goodness we have fraud protection on, and it had already been shut down. One credit card had been used several times for gas, but that is protected as well. I guess that's what you do when you steal a credit card - you go to the gas station and offer to fill peoples tanks with gas for cash. It's easy to sell someone a tank of gas for $20 cash when you are putting $60 on another persons credit card! We are so fortunate that they did not take our home computer. We were able to access all of our accounts and find phone numbers etc. I will say that we will be making an easy access list of all numbers like this, and also a list of the main items I keep in my purse. I keep thinking of things that I will have to replace. Like clips for my uncontrollable hair. And my Red Robin frequent flyer card. And lipstick. Who can live without that? PS Seriously, if you don't have a ready list of contacts for if your purse or wallet are stolen please make one. Also, I'm not joking about a list of things normally in your purse. It would really make things easier for me if I had one. Came over from My Charmer party. I am so sorry about the robbery. You have a sense of humor about it, but I know something like that really shakes you up. Thanks for the tips! 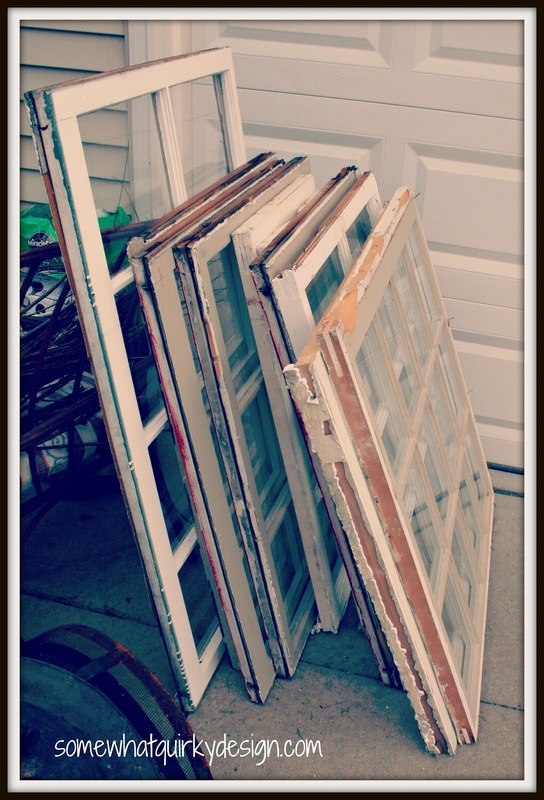 Now on a more serious note: as someone who has rehabbed, painted, distressed, acid-etched and otherwise abused quite a number of wooden windows in my day, Let me tell you how scarce they are getting to find. My Habitat has not gotten wooden windows with panes in three months! So many people have already exchanged them for metal or vinyl! The same with wooden shutters and ladders. Boo! Hiss! Aluminum! It is time for some serious hoarding! Gosh, I'm so sorry about your break in. You seem to be in good spirits about it. I think I'd be devastated! At least this story has a happy ending...all those great (and free) furniture and window finds! What will you do with the windows? The worst of being robbed is figuring out, stopping stuff and replacing stuff. It is also really insulting. Glad you were able to put a positive spin on that meanness. Love the windows. Rarely find, like maybe 2, in several years. Ditto for shutters. Great pick ups! Look forward to seeing what you have planned for the windows. I don't have anyone calling to give me hot tips on the location of junk, but I'm making my purse list and phone number list and learn from your misfortune. Never say never. Man, those looked like so many more when we loaded them into your vehicle! It doesn't look like a very big haul in that picture. You forgot to mention how happy the installer was to get rid of the extra windows. Oh, Karen, this is awful. What a horrible experience you have gone through. I will learn from your unfortunate experience. I hope something awesomely fantastic happens to balance out this terrible deed! OH NO!!!!!! first i started to laugh because of your friends alerting you and then i got to the robbery and had a pit in my stomach! i just feel horrible for you! i am glued to see what you do with the FREE windows!!!! sending hugs and if there is anything i can do? that is truly sincere...you just never know so my offer is there! Oh my lord, I am so glad you guys are ok. What a pain in the neck! Another tip I've heard is to take a video or pictures of all items normally in your purse and also around your house for the unfortunate instances that there is a break in. Oh no! I am so sorry about the thefts. I have never understood why someone would think it is ok to take something that isn't theirs. At least you found some pretty neat curb side finds to help cheer you up. I feel your pain, Karen, I had a break in one day while I was gone a very short time. I still think of it every time I leave my house. Having a list is a great idea. I know it's all such a pain and nervewracking. I hope you get a good insurance settlement. As for your junking alerts...that's so cool. I had a friend call to tell me about junk yesterday, but calling while a junk addict is stuck at work with no truck is kind of cruel if you think about it. :) That headboard you got is fantastic... as is the desk! I am so sorry you were robbed - how horrible!! I am definitely in need of writing down all of my credit cards. 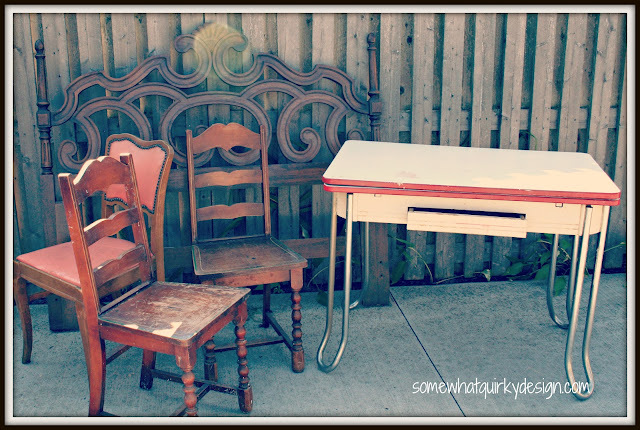 So you'll just have to be in search of some more curbside finds like those amazing windows! I actually spotted a huge pile the other day but only grabbed 2 (oh how I wish I had been greedier)! wishing you a better week ahead!!! you have awesome friends!!! I am so sorry about the theft, this is awful, truly sorry. I'm so sorry about the robbery! Thank goodness you have fraud protection. The windows are a great find. I'm sure you'll do something fab with them. That is some nice street merch. I wish I was that lucky. I'm so sorry you were robbed. I will heed your warning and make that list. Thanks so much for visiting me and following, I'm following you too! I love your windows....but I am so sorry about the robbery. Yikes. It sounds like you are handling it so well. I feel your pain - we were broken into about a year ago and they stole my jewelry and my husband's two most precious hunting trophies - a huge buck and a bear mount (now who is stealing those, right?). It was hard dealing with the kids' fears when we had a hard time with our own. Hope they catch them! I found you through It all Started With Paint. Glad to find you! Sorry about the robbery...bummer! I'm dying to know what you're doing with the windows! I have several and am drawing a blank on something creative and original.